Puppy Of The Month Book Club: The Dragon Masters and their beasties. 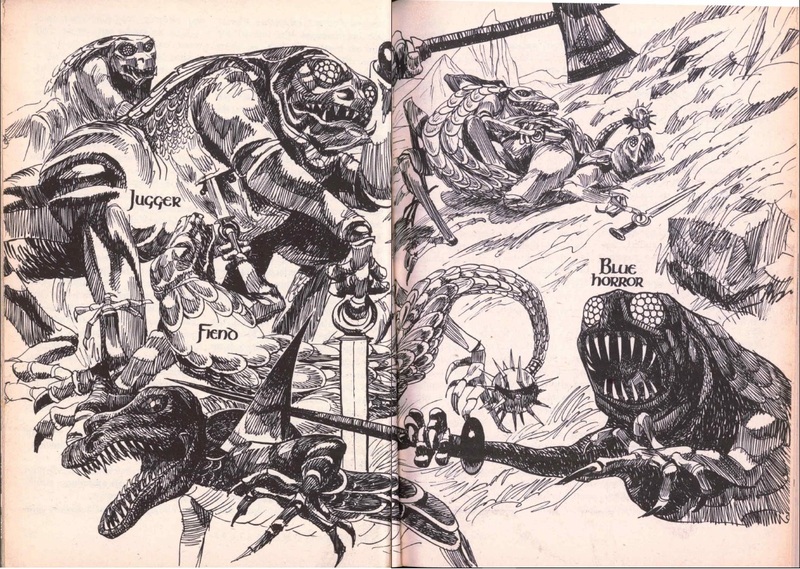 In a previous entry, Jon Mollison mentioned the races in The Dragon Masters. He's correct, and the main weapon used in the conflict between the two human kingdoms and, later, between humans and the "Basic" (or Grephs) are living organism, selectively-bred from the original stock of their enemies. The humans use grephs, and the grephs use humans. This genetic arms race and its panoply of creatures may be a bit confusing. 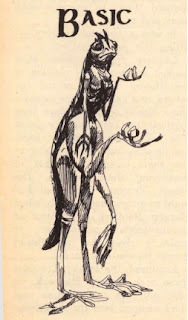 Jack Vace had a knack for descriptions, but there is a limit to what words can convey, not to mention that in this story Vance doesn't seem to have bothered giving detailed descriptions of the creatures (perhaps he knew someone was going to draw them?) Luckily, there's another way! The original story was published in Galaxy, August 1962, and it was supplemented by awesome drawings of the various creatures. 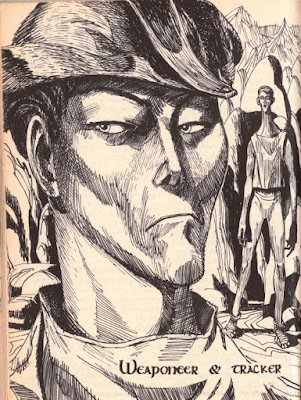 I can understand why so many (now famous writers) young people mentioned this story as the reason they fell in love with Vance, but it wouldn't surprise me if the drawings by Jack Gaughan also helped a bit. Use these sketches as a visual aid if you are reading (or rereading) The Dragon Masters. -The Basics (or Grephs): Space-faring and technologically advanced. They look somewhat insectoid/reptilian and are gray or "pearl-pallid"
-The Spider: they serve as mounts for the humans. "A few minutes later Joaz Banbeck appeared on Banbeck Verge riding a Spider caparisoned in gray and red velvet." 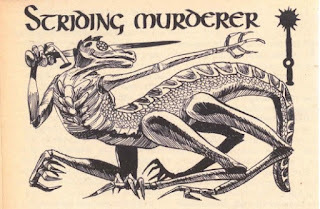 -The Striding Murderers: Described as the cousins of the Long-horned Murderers. In one sentence they are described as "silken." From the description of a battle, they seem to have the function of "light cavalry." -Long-horned Murderers: If the Striding Murderers were "light cavalry," these are clearly the equivalent of Heavy Cavalry. 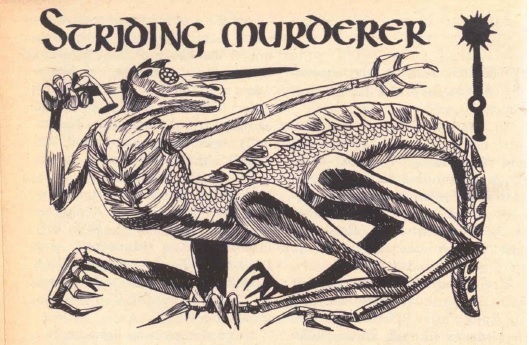 "Long-horned Murderers, their fantastic chest-spikes tipped with steel.[...] 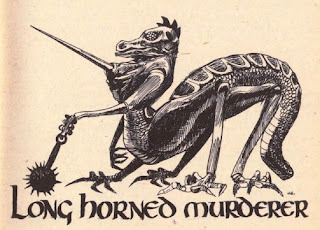 steel-spiked and crested with steel prongs; [...] Banneck's long-horned Murderers came circling, struck from the flank into Carcolo's Striding Murderers, goring with steel-tipped horns, impaling on lances." 1. Jugger: They are massive, brutal, well-armored, and not very intelligent. 2.Blue Horror: Intelligent, massive, agile, quick, and good climbers. 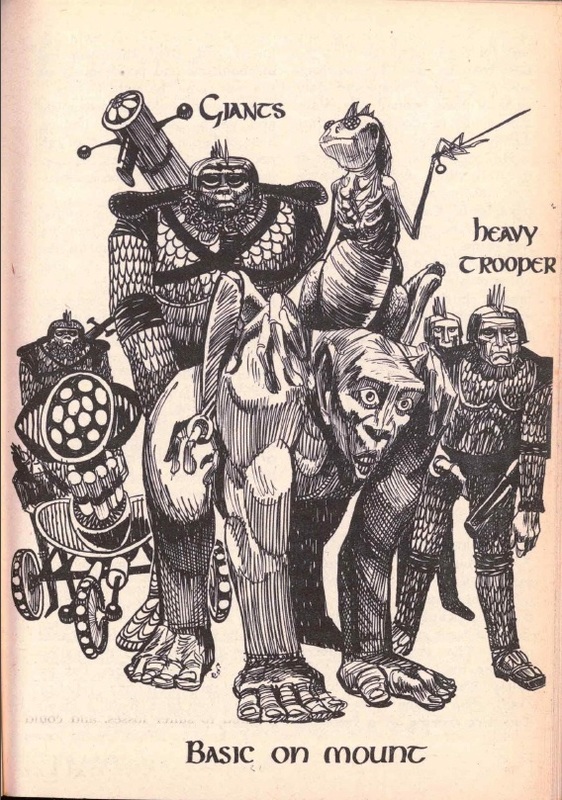 "black-green [...] useless on the cliffs [...] low to the ground, immensely strong, tail tipped with a steel barbel [...] Flanking the Juggers marched the Fiends, carrying heavy cutlasses, flourishing their terminal steel balls as a scorpion carries his sting." -Termagaunt: apparently, the most common "dragon." "the rust-red Termagant [...] the fecund Termagant [...] Ervis Carcolo turned away, pretended to watch a pair of Termagants exercising with wooden scimitars. [...] small active dragons with rust-red scales, narrow darting heads, chisel-sharp fangs. "A man pitted against a Termagant stood no chance, for the scales warded off bullets as well as any blow the man might have strength enough to deal"
1.A quarrelsome, scolding woman, especially one who is old and shrewish. 2. (obsolete) A boisterous, brawling, turbulent person, whether male or female. Perhaps it's another Vancian joke. In any event, Warhammer 40K fans might recognize the word because one of the Tyranid creatures is called Termagaunt. 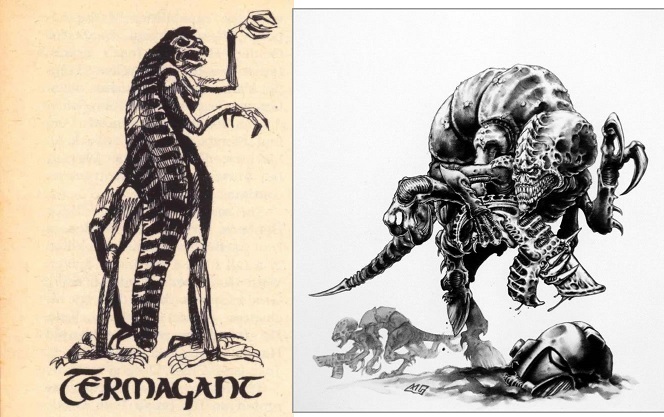 I suspect this is not a coincidence because the Tyranids use all sort of bio-weapons and also engage in some kind of genetic engineering (with themselves, though,) not to mention that this is how Vance's Termagant looks, compared to how W40K Termagaunts originally looked. But the Basics (named like that by the humans because they are the basic template for all the other creatures*) also practiced their own form of selective breeding. In fact, they probably started it and it seems it's part of their species worldview or "political" ideology. Their goal seems to be to "integrate" the other species they encounter, to make them into slaves, weapons, and so on. Of course, the book only mentions their conflicts with the remaining humans, so we don't know what else are they doing out there, but I like the theory that they are doing this with all the intelligent species they encounter. 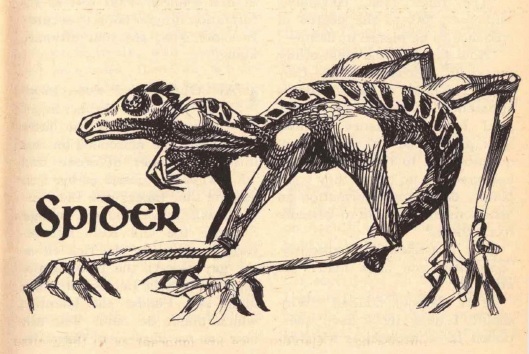 Really, after seeing these images, I think these creatures would be a great addition to any D&D campaign or, even, to some tabletop wargame. I mean, the Dragons are almost begging to be converted into miniatures. *Ironically, the Greph probably see themselves as the Basic or original creature too, but for different reasons and with another meaning in mind. Those pictures help considerably. I thought that this story was light on description for a Vance work. It's a shame he didn't harp on the nature of the Giants and Weaponeers in his usual style. They rolled off my back like nothing in the story, but those pictures all give me the creeps thinking about somebody tinkering with human genetics that way. It makes the Basics seem that much more alien and menacing when you see those.